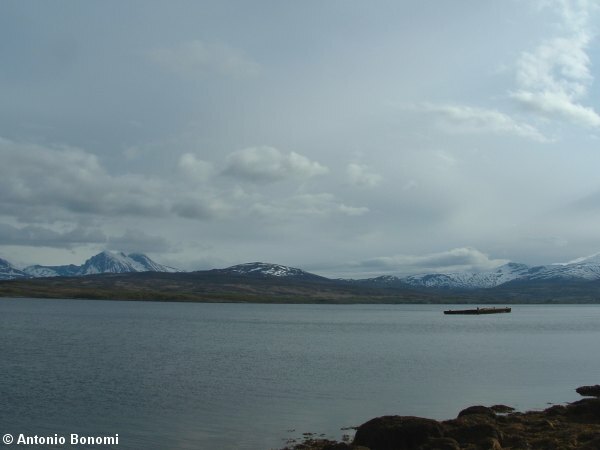 this time we go to visit Sorbotn, an anchorage place south of Hakoya island, west of Tromso city, the last Tirpitz anchorage and the place where Tirpitz was finally sunk. This is the place were my ' Lovely Queen of the North ' is resting in peace together with around 1.000 crew members. 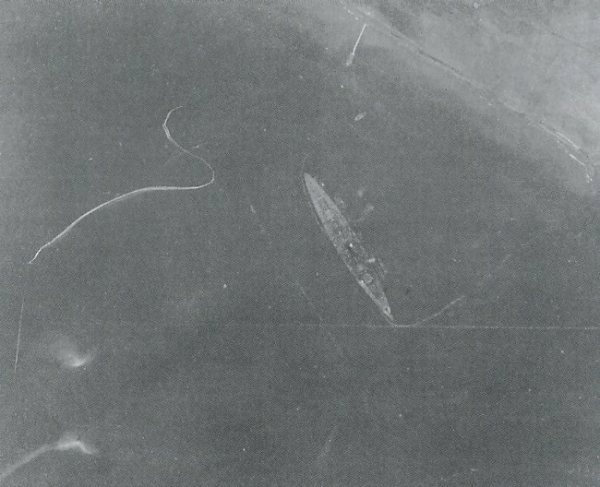 here you can see the Tirpitz anchored at Sorbotn into nets protecting her from Torpedoes. But the danger as they already know was coming from the air, from the Lancaster 617th and 9th Squadron, the famous ' Dambusters ' with modified airplanes and armed with Tallboys Armour Piercing special design bombs ( 5.4 tons each ) just created to sink her. 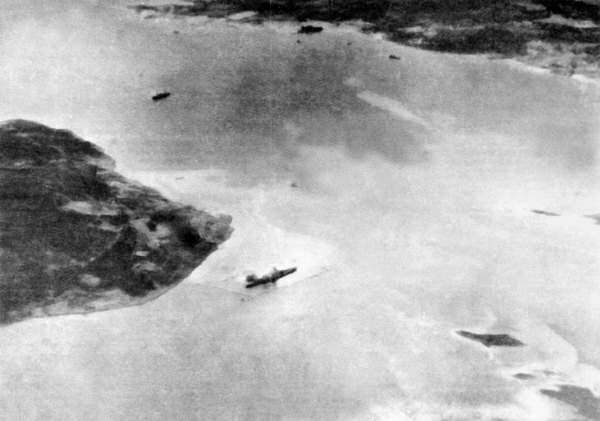 Notice the position of Tirpitz with the bow oriented to Tromso to east and the stern closer to Hakoya to west. 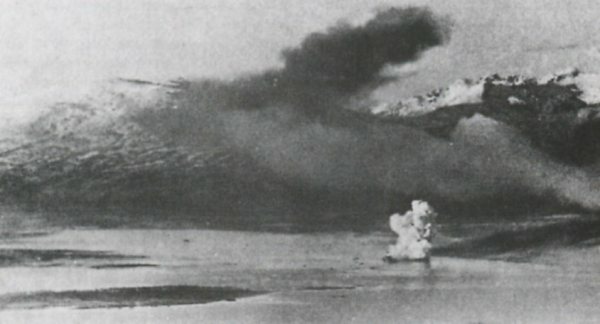 Already while into KaaFjord in Alta Tirpitz was hit by the Dambusters during Operation Paravane attack on September 15th, 1944 ( reference the craters shown into KaaFjord LongStraumsneset anchorage on the other post ). 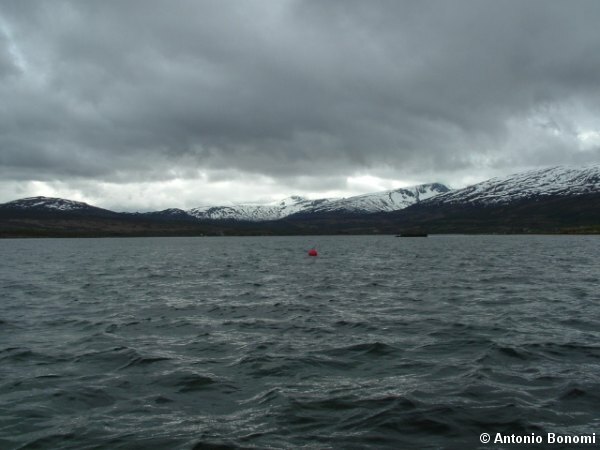 The bow of Tirpitz was hit just were the right anchor chain runs, ahead of the capstan wheel. The bomb passed all the way thru the decks like on butter, and exploded on the bottom of KaaFjord, lifting up the whole ship forward. The bow was totally smashed below water level on the starboard side as photos well shows, juts like a twisted can. 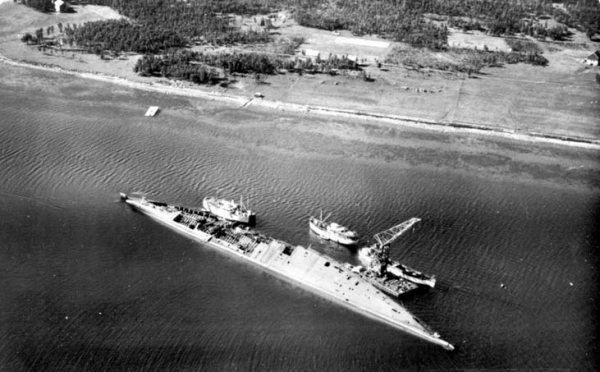 Tirpitz was not able than to sail at more than 8-10 knots, due to water pressure on forward compartments. 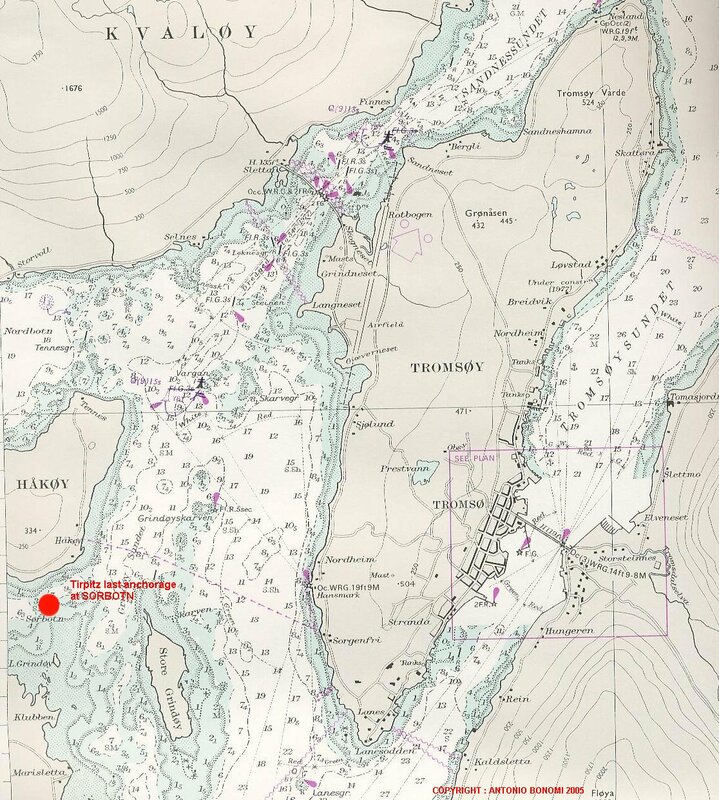 Slowly, helped by tugs the Tirpitz set sail from KaFjord to this place, were she anchored to be used as floating battery to fire on the only road coming down from north to the coming Russians, and help the retreating German divisions moving south. They choose the place in order to still use the ship even if sunk, as the water below her was less than a meter and they knew she was going to be hit again and probably sunk, but this was not enough as we know. On this photo taken from 15.000 feet by Flt Ltnt Sandy Powell and Flt Sgt Joe Townsend of Nr 540 Sqn flying on a PRU Mosquito PR XVI NS64 on 18 October 1944 you can see the Tirpitz anchored 260° at 3 and 3/4 miles west of Tromso. Notice the canvas light spot on the bow covering the huge hole created by the previous Talboy hit. You can notice also the deck been very dark like the A and D turrets colour. this photo taken by one of the Lancaster or PRU Mosquito following Op. 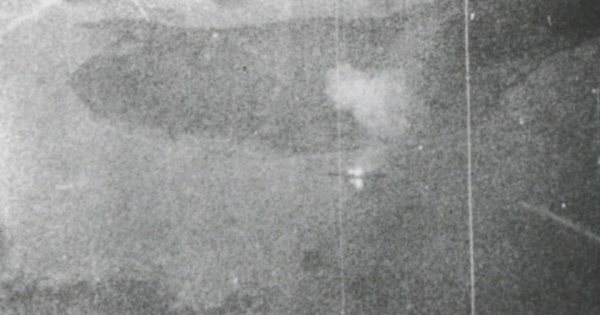 Catechism raid on Tirpitz shows probably the first hit on Tirpitz on the catapult, at midship port side. On this photo you see Tirpitz on her last moments. 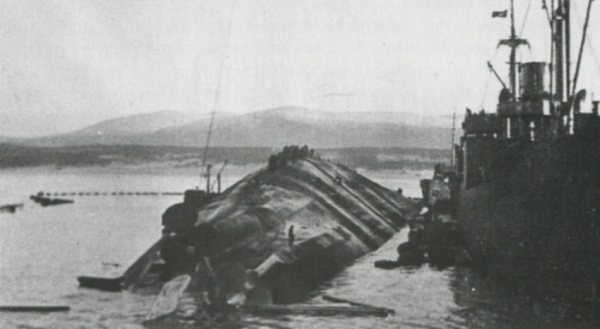 Tirpitz soon after the capsizing. Repair ship went alongside to help survivors and try to free the crew members still on the capsized hull. 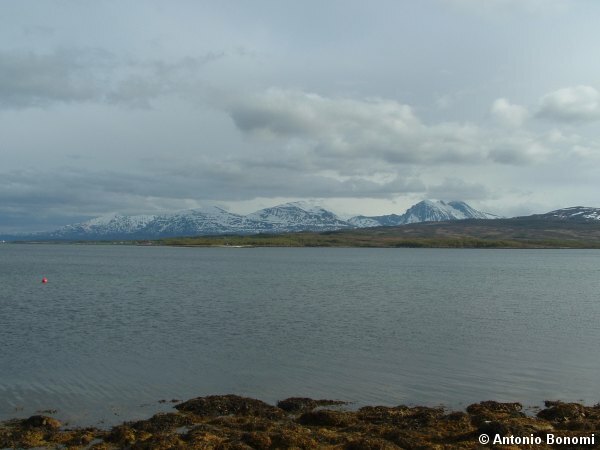 On the background Tromsoy island. Notice the persons on the hull, the torpedo nets and the propellers. From this photo you cannot see the huge damage suffered by the bow after September 15th attack in KaaFjord, while a front view when water goes down will show the devastation the ship suffered. 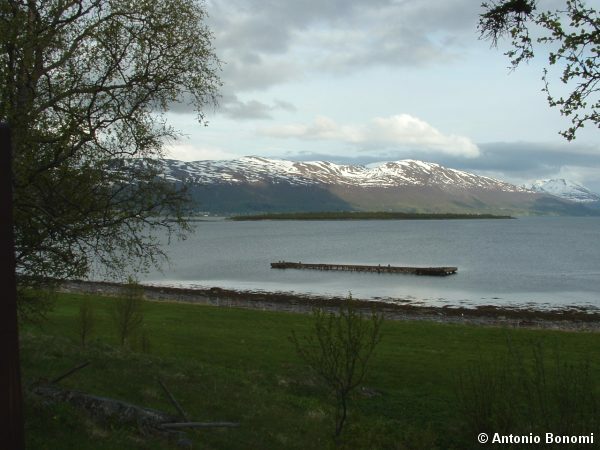 Time after Tirpitz still intact but without propellers, the torpedo nets has been removed aroud her. Demolition works started, notice the crane, the building in costruction on the Hakoya island and one of the Tallboy's crater still visible. 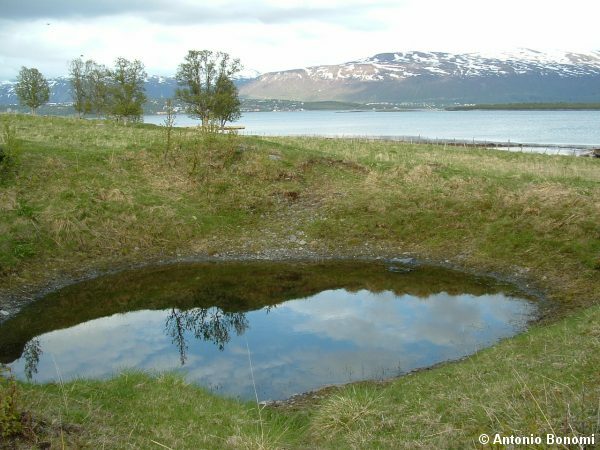 Most of the craters are still well visible today especially when the water reaches the lowest lever. 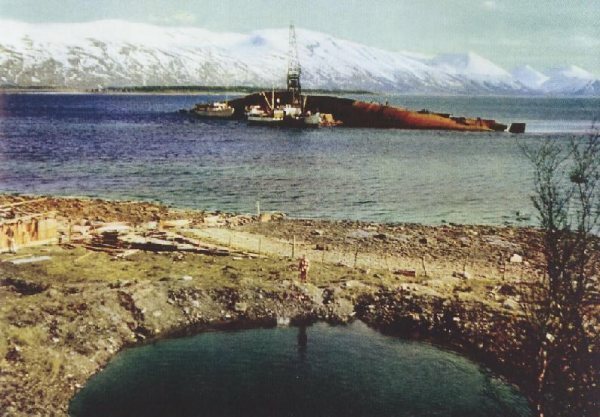 Here the water is low, and you can see other craters on the Hakoya beach, while demolition works on Tirpitz continue. 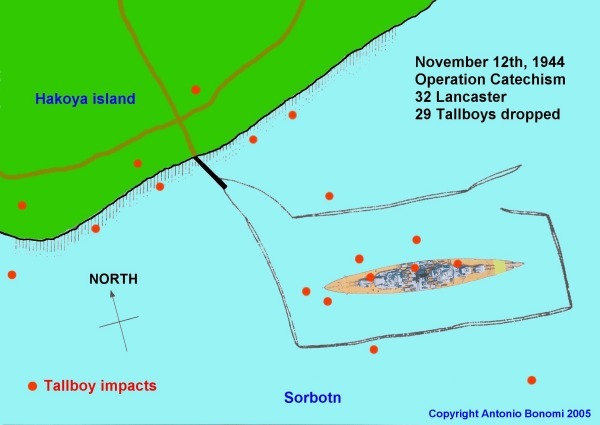 here you can see the correct positions of the Tallboy hits on Tirpitz during Operation Catechism of November 12th, 1944.
and here the full set of Tallboy impacts on the closest area of Tirpitz anchorage. On many book maps you can only see some of the 617th Squadron initial ones out of the first wave of 17 Lancasters. Here you can see many of the 9th Squadron as well, so the other 12 Lancasters of the second wave. On this map you have 18 Tallboys out of 29 total. The other 11 were dropped out of this map area, mostly on north east. It was not so difficult to make this map, as the craters are still there well visible. 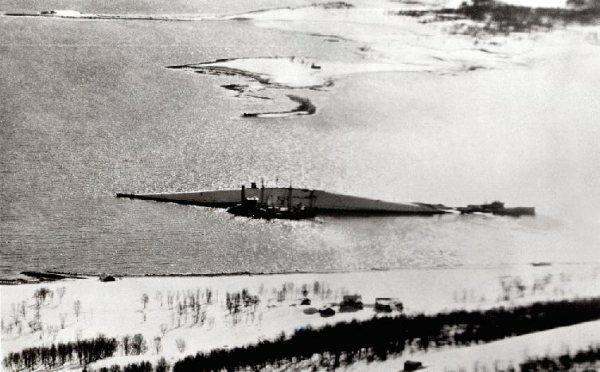 did the capsized was really entirely demolited after the war?Nothing remains of her now? 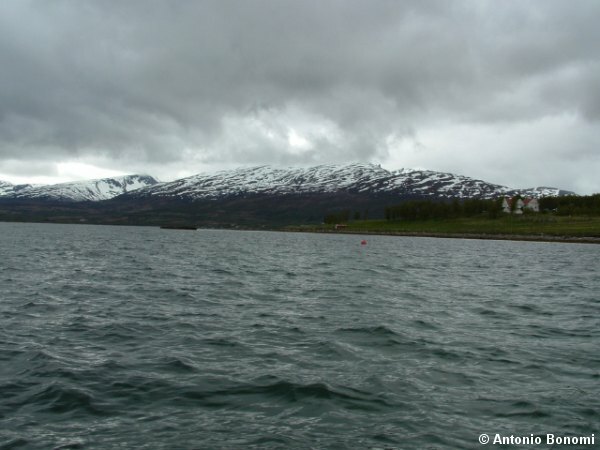 almost nothing is left of Tirpitz there now. The ship was totally dismantled and everything was recovered by a Norwegian Company. Few remains on the water, less than 20 % more or less, everthing into deep mud. You well see how the area looks today very soon. after having seen what happened on Sorbotn on November 12th, 1944, lets see how the place looks today. Just turning back from the monument toward the sea as I did you can see the platform used to demolish the Tirpitz still there, but now closer to the beach as the ship wreck was further ahead as you can see on previous photos. On the side of the monument, just 50 meters away on the right you start seen big craters like this one, the Tallboy that missed the ship and went on the beach. Now lets see were the ship was, her stern was a bit ahead of the current platform position. and her bow was exactly were this red baloon is now, to signal the presence of the wreck remains to the boats. So we took a float and we sailed around her, taking some photos. From the red baloon to the platform is were the Tirpitz is resting finally in peace with her crew. Last edited by Antonio Bonomi on Mon Jan 02, 2006 10:21 pm, edited 1 time in total. It is interesting that the Norweygians put a plate to remember it. Do you remember Antonio what it said? The area is called '' Tirpitz Parken '' and you can see there is the usual accomodation for barbecue and pic-nic on the park for tourist. 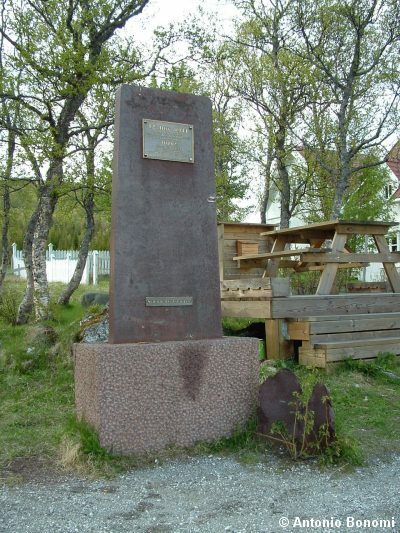 means the steel plate is from Tirpitz in Norwegian. The Tallboy piece at the bottom has no plates, but having seen some of those pieces of steel on the craters I have examined either on KaaFjord, on top of Sakkobadne mountain ones on the rocks and there, I can guarantee you that it is a piece of a Tallboy bomb. Would you have any information regarding the German minesweeper that received the mayday call from the Tirpitz which ultimately came to rescue survivors.